I love playing cards. There’s just something wonderful about the look and feel of a handful of cards. I love playing games with them, doing lame magic tricks and throwing them around while pretending to be Gambit (the greatest of all the X-Men). I even enjoy just looking at them. 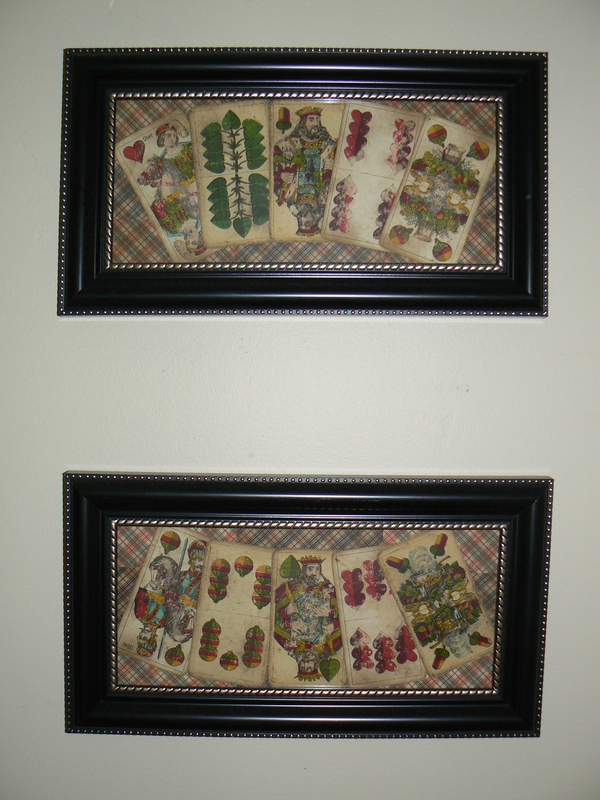 On the wall of our game room I have some framed playing cards made in Germany during the 1800’s. They are a bit different from the ones we use today. They have no indices (the handy numbers in the top left corner of each card) and they court cards have an uber- and unter-knave instead of the queen and jack. The suits are different as well, with leaves, bells and acorns in place of the customary spades, diamonds and clubs. I have to say that I really like those old cards, even though they are a thing of the past. But I also like the cards I use today. I just opened a new pack yesterday and I love the fresh new feel of the cards. It reminds me of the Thanksgiving holiday. I cherish the memories I have of Thanksgivings growing up. I loved going to my grandparents house and eating an amazing meal. I loved the laughter and games and people falling asleep on the couch. I especially loved the feelings of love and joy that seemed to fill the room. The past few Thanksgivings have been different. We have no extended family nearby, so we either gather with a few friends or simply stay at home with just our little family. Either way we have a great meal and some laughter and games after the feast. I love seeing my kids put olives on their fingers and sneak that extra piece of pie. I like the simplicity of relaxing in our home. Which is my ideal Thanksgiving? I’d have to say both. I can love the similarities between the two and enjoy the differences as well. So, to all of you out there, may you have a joyous Thanksgiving – however you choose to celebrate it.